The Royal mounds of Gamla Uppsala from the fifth and the sixth centuries. Originally, the site had 2000 to 3000 tumuli, but owing to quarrying and agriculture only 250 remain. A tumulus (plural tumuli) is a mound of earth and stones raised over a grave or graves. Tumuli are also known as barrows, burial mounds, or kurgans. When composed largely or entirely of stones they are usually referred to as cairns. The phenomenon appears early in human history, during the Neolithic era, and although used almost universally tumuli differ in size, structure, and usage with each culture. In one aspect, the tumulus is a simple way to bury the dead and honor them with a memorial, for it requires little sophistication or technology. On the other hand, though, the size of many of these mounds is impressive by today's standards, and far more so considering the lack of technology available in ancient times. Their appearance throughout the world in unrelated cultures indicates a universal appreciation for the dead members of their society, and a desire to mark their life permanently in the physical world. The term tumulus derives from the Latin word for mound or small hill. It shares the root tum- "to bulge, swell," with the word tumor. Tumuli differ from one culture to another. The simple ones were graves dug into the ground, where bodies were deposited and then a large amount of earth was piled on top, creating a mound. The more complex type were actual structures, either built on top or sunken slightly into the ground and then covered by earth. Sometimes, large existing hills were tunneled into and graves were carved from the interior. Miamisburg Mound, the largest conical mound in Ohio, is attributed to the Adena Culture. Although people were aware of the existence of burial mounds for many years, they remained mysterious until the nineteenth century, when amateur archaeologists began using scientific techniques in regards to excavations. The first mounds excavated were in Peru, at the site of the Huaca de Tantalluc, but Thomas Jefferson, before he became the third President of the United States, was the first to receive widespread recognition for excavating tumuli. By noting the stratigraphy of the soil and rock on a cross-section of the burial mound he excavated in the Mississippi Valley, and the relative age difference between the skeletons found in the lower sections compared to those remains closer to the surface, Jefferson was able to deduce that the mound had been revisited several times over the course of years, each time a new layer of sediment and human remains being added. While this did not end the debate over who had created the mounds, it did constitute a breakthrough in how archaeology could be used to examine the phenomenon. With the advancement of scientific approaches in regard to archaeological techniques in the twentieth century came the realization of just how much information could be ascertained from tumuli: settlement patterns, religious beliefs, new dating techniques, and evidence of human evolution were just some of the few items of information that careful study of tumuli could reveal. However, with this realization came an ethical question which archaeology has had to deal with in all cases of human burials. To excavate a tumulus means to destroy it and remove remains specifically laid to rest in the ground. Even if the information yielded is immensely beneficial, does it justify such a violation is something archaeologists now take into consideration, especially if the descendants of the deceased are still alive (such as the Native Americans of North America). Since the first excavations, many burial mounds have been completely desecrated and remains divided up amongst the academic institutions of the world. In contemporary times, great care is taken to leave certain tumuli un-excavated, but with the use of digital imagery techniques and sight observation, burial mounds that are not excavated continue to be studied. 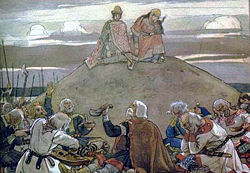 Burial of Oleg of Novgorod in a tumulus in 912. Painting by Viktor Vasnetsov. The process of creating tumuli is one that has fascinated archaeologists for some time, if for no other reason than that it is one of the few human activities that appear to be universal and not cultural diffused. The act of human burial has long been viewed as an outgrowth of proto-religious belief; how the body is cared for after someone has died affects that person in the afterlife. Burial mounds appear to be no different. Some have argued that tumuli started as burial sites for people of importance and significance, the visible mounds paying tribute to these persons of importance, much the same way that the pyramids were both tombs and tributes to the Pharaohs of ancient Egypt. Others have argued against this claim, suggesting that burial mounds were completely random phenomena with no special thought going into their creation and construction. The Burgstallkogel (458 m; also known as Grillkogel) is situated near the confluence of the Sulm and the Saggau river valleys in Southern Styria, about 30 km south of Graz between Gleinstätten and Kleinklein. The hill hosted a significant settlement of trans-regional importance from 800 B.C.E. to about 600 B.C.E. Surrounding the hill is one of the largest iron age hill grave necropolises that exists in continental Europe. It was originally composed of at least 2,000 tumuli. In contrast to the grave mounds in the Western Hallstatt zone where the deceased were mostly buried intact, all Burgstallkogel dead were cremated, frequently together with some of their personal articles, before the remains were deposited in the stone grave chamber and earth was piled on it to erect the tumulus. 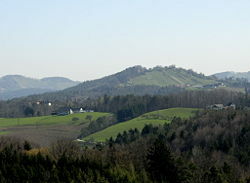 The "common citizen" tumuli of the Sulm valley necropolis (believed to have numbered in excess of 2,000 before agriculture destroyed most of them) surrounded the Burgstallkogel settlement on all sides, and originally they covered much of the hill range between Gleinstätten and the village of Kleinklein, where a small area had been set aside for the much larger tumuli of the chieftains. The oldest grave mounds in the necropolis correspond to the youngest surviving settlement strata of the Burgstallkogel settlement, while two later (Hallstatt B3/C1) burial phases can only be inferred from secondary deposits. Besides it being larger than most other necropolises in the Eastern Hallstatt area, the fact that the Sulm valley necropolis is set apart by the fact that preserved non-aristocratic burials far outnumber chieftains' graves. 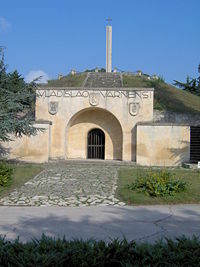 The rulers and their aristocracy, which prided itself of military leadership, had the easternmost part of the necropolis to themselves. Naturally, their tumuli (of which four are known - Hartnermichelkogel I and II, Pommerkogel and Kröllkogel) were the largest and richest ones, containing significant amounts of bronze vessels and iron armament in addition to pottery. 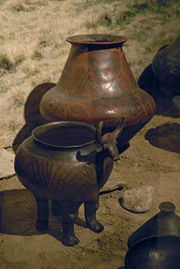 It is assumed that the chieftains' tumuli were modeled on Etruscan tombs. The cremation places have not been found, but are supposed to have been either near the grave site or near the hilltop. During the early Middle Ages, Slavic tribesmen inhabiting what is now the Czech Republic used to bury their dead under barrows. This practice was widespread in southern and eastern Bohemia and some neighboring regions, like Upper Austria and Lusatia, which at that time were also populated with Slavic people. However, there are no known Slavic barrows in central part of the country (around Prague), neither they are found in Moravia. This has led archaeologists to speculations about at least three distinct waves of Slavic settlers, which colonized Czech lands separately from each other, each wave bringing its customs with it (including burial rituals). At places where barrows were constructed, they are usually found in groups (10 to 100 together), often forming several clearly distinct lines going from the west to the east. The best Slavic barrow sites can be found near to Vitín, a small village close to České Budějovice. There are two groups of barrows close to Vitín, each containing about 80 barrows ordered in lines. Some of the barrows are as much as two meters high. Some of the world's most prominent tumuli, the Macedonian tombs and a cist-grave at Vergina, tomb of Philip II (359-336 B.C.E.) of Macedonia and father of Alexander the Great (336-323). Speculation that the other grave found there is that of Alexander IV is controversial. His corpse was allegedly buried in Memphis during the turmoil of the Diadochi after his death in 323 B.C.E..
Excavations were first undertaken at this site in the nineteenth century. L. Heuzy of France and K. Rhomaios of Greece began but were stalled by the First and Second World Wars. In the 1960s, M. Andronicos was director of the excavations and the cemetery of the tumuli was investigated. The Palace of Philip II was excavated by a team from Thessaloniki University along with part of the necropolis being investigated by the Ministry of Culture. 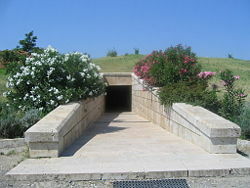 1977 was the pivotal date that M. Andronicos brought to the attention of the world, the royal tombs in the Great Tumulus of Vergina, (ΜεγάΛα) tomb. However, the townspeople of Vergina put a halt to any more excavations, under the auspices of preserving their beautiful surroundings and heritage. In Britain, early references to tumuli were made by William Camden, John Aubrey, and William Stukeley. During the nineteenth century in England the excavation of tumuli was a popular pastime amongst the educated and wealthy middle classes, who became known as "barrow-diggers." This leisure activity played a key role in laying the foundations for the scientific study of the past in Britain but also resulted in untold damage to the sites. Barrows were popularly used to bury the dead from the late Neolithic until the end of the Bronze Age, 2900-800 B.C.E.. Square barrows were occasionally used in the Iron Age (800 B.C.E. - 43 C.E.) in the east of England. The traditional round barrow experienced a brief resurgence after the Anglo-Saxon invasion, as Scandinavian burial practice became popular 500-600 C.E. These later barrows were often built near older Bronze Age barrows. Burial mounds were in use until the eleventh century in Scandinavia. In their undamaged state they appear as small, man-made hillocks, though many examples have been damaged by plowing or deliberately damaged so that little visible evidence remains. By burning the deceased, it was believed that the person was transferred to Valhalla by the consuming force of the fire. The remains were covered with cobblestones and then a layer of gravel and sand and finally a thin layer of turf. As the old Scandinavians worshiped their ancestors, the mounds were also places of worship. Of note is King Björn's barrow in Håga (Old Norse name: Haug) near Uppsala. Sarmatian Kurgan fourth c. BC, Fillipovka, S. Urals, Russian Federation. Archaeological dig lead by Russian Academy of Sciences Archeology Institute Prof. L.Yablonsky, Summer of 2006. First known kurgan to be completely destroyed and then rebuilt to its original appearance. Kurgan (Russian: курга́н) is the Russian word for a tumulus, a type of burial mound or barrow, heaped over a burial chamber, often of wood. Kurgan type barrows were characteristic of Bronze Age peoples, from the Altay Mountains to the Caucasus, Romania, and Bulgaria. Sometimes, they were quite complex structures with internal chambers. Within the burial chamber at the heart of the kurgan, members of the elite were buried with grave goods and sacrificial offerings, sometimes including horses and chariots. A circular burial mound constructed over a pit grave and often containing grave vessels, weapons, and the bodies of horses as well as a single human body; originally in use in the Russian Steppes but later spreading into eastern, central, and northern Europe in the third millennium B.C.E.. The tradition of kurgan burials touched not only the peoples who buried most of all of their deceased in kurgan structures, but also neighboring peoples who are known as not having a kurgan burial tradition among general population. The most obvious archaeological remains associated with the Scythians are the great burial mound (kurgans), some over 20 meters high, which dot the Ukrainian and Russian steppe belts and extend in many great chains for many kilometers along ridges and watershed. It is from them that most has been learned about Scythian life and art. 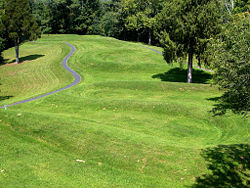 Serpent Mound – an ancient Native American ceremonial structure in Ohio. Mound building was a central feature of the public architecture of many Native American cultures from Chile to Minnesota. Thousands of mounds in the United States have been destroyed as a result of farming, pot-hunting, amateur and professional archaeology, road-building, and construction. Surviving mounds are still found in river valleys, especially along the Mississippi, Tennessee, and Ohio Rivers. Many engraved conch shell artifacts, such as this one from a mound in Tennessee, have been found. 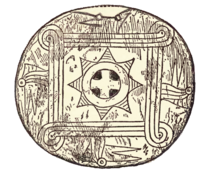 Effigy mounds were used for burial, to support residential and religious structures, to represent a shared cosmology, and to unite and demarcate community. Common forms include conical mounds, ridge-top mounds, platform mounds, and animal effigy mounds, but there are many variations. 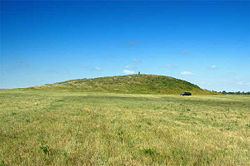 Mound building in the United States is believed to date back to at least 1200 B.C.E. in the southeast. The Adena and Mississippian cultures are principally known for their mounds. The largest mound site north of Mexico is Cahokia, a vast World Heritage Site located just east of St. Louis, Missouri. The most visually impressive mound site (due to the area being free of trees) is in Moundville, Alabama. The largest conical burial mound can be found in Moundsville, West Virginia. Other sites in the United States include Indian Mounds Park, Wisconsin, Indian Mounds Park (Saint Paul, Minnesota), and Indian Mound Park, Alabama. 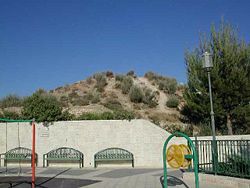 Jerusalem Tumulus #2 in 2004. Near the western city limits of modern Jerusalem in Israel, 19 tumuli have been documented. Though first noticed in the 1870s by early surveyors, the first one to be formally documented was Tumulus #2 in 1923 by William Foxwell Albright, and the most recent one (Tumulus #4) was excavated by Gabriel Barkay in 1983. Since 21 kings reigned in Jerusalem during the Israelite monarchy from David to Zedekiah (who was conquered and humiliated by the Chaldean king, Nebuchadnezzar), it is not unreasonable to suspect that these mounds were the locations of ceremonies to mourn/honor them after they had already received proper burial in the royal tombs (probably located in the heart of the city where they could be continuously guarded). Gabriel Barkay popularized this theory after studying tumuli near Salamis in Cyprus. On the Anatolian peninsula, there are several sites where one can find the largest specimens of these artificial mounds in the world. Three of these sites are especially important. Bin Tepeler (and other Lydian mounds of the Aegean inland), Phrygian mounds in Gordium (Central Anatolia), and the famous Commagene tumulus on the Mount Nemrut (Southeastern Anatolia). Bin Tepeler (a thousand mounds in Turkish) is in the northwest of Salihli district of Manisa province. It is a Lydian necropolis which dates back to seventh and sixth centuries B.C.E.. The mounds are called "the pyramids of Anatolia" as there is even a giant specimen among them which attains 355 meters in diameter, 1,115 meters in perimeter and 69 meters of height. According to the accounts drawn up by Herodotus, this giant tumulus belongs to the famous Lydian King Alyattes II who ruled between 619-560 B.C.E.. There is also another mound belonging to King Gyges. In this site, there are 75 tumuli dating back to Lydian period which belong to the nobility. A large number of smaller artificial mounds can also be observed in the site. There are other Lydian tumuli sites around Eşme district of Uşak province. Gordium was the capital of the Phrygian Kingdom. Its ruined site contains approximately 80-90 tumuli which date back to Phrygian, Persian, and Hellenistic periods. The mounds were built between the eighth century B.C.E. and third or second century B.C.E.. The biggest tumulus in the site is believed to belong to the famous Phrygian King Midas. This mound was excavated in 1957 and several bronze artifacts were collected from the wooden burial chamber. On the peak of Mount Nemrut in the east of the Adıyaman province of Turkey is situation a tumulus which dates back to the first century B.C.E.. It belongs to the Commagene King Antiochus I Theos of Commagene who ruled between 69-40 B.C.E.. The most interesting thing about the tumulus is that it is made of broken stone pieces which renders excavation attempts almost impossible. The tumulus is surrounded by ceremonial terraces in the east, west and north. The east and west terraces have tremendous statues (reaching 8 to 10 meters of height) and bas reliefs of gods and goddesses from the Commagene pantheon. Noge-Ōtsuka Kofun tumulus, Tokyo, early fifth century. Kofun are megalithic or tumuli in Japan, constructed between early third century and early seventh century. They gave their name to the Kofun period (middle third century—late sixth century). 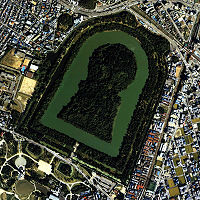 Most of the Kofun have the Keyhole-shaped mount zenpo-koenfun, which was unique to ancient Japan. There are also circular enpun, rectangular zempō-kōhō, and square hōfun. Kofun range in size from several meters to over 400 meters in length. The largest kofun is Daisen kofun, the tomb of the Emperor Nintoku; the largest tomb by area in the world. The oldest Japanese kofun is said to be Hokenoyama Kofun located in Sakurai, Nara, which dates to the later third century. In the Makimuku district of Sakurai, earlier keyhole kofun (Hashihaka Kofun, Shibuya Mukaiyama Kofun) were built around the early fourth century. The trend of keyhole kofun first spread from Yamato to Kawachi (where gigantic kofun such as Daisen Kofun of Emperor Nintoku are built), and then throughout the country (except for the Tōhoku region) in the fifth century. 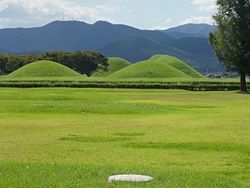 Burial mounds of the Silla kings in Korea. The most famous tumuli in Korea, dating around 300 C.E., are those left behind by the Korean Baekje, Goguryeo, Silla, and Gaya states and are clustered around ancient capital cities in modern-day Pyongyang, Seoul, Jian, and Gwangju. The Goguryeo tombs, shaped like pyramids, are famous for the well-preserved wall murals like the ones at Anak Tomb No.3 which depict the culture and artistry of the people. The base of the tomb of King Gwanggaeto is 85 meters on each side, half of the size of the Great Pyramids. Goguryeo Silla tombs are most noted for the fabulous offerings that have been excavated such as delicate golden crowns and glassware and beads that probably made their way to Korea via the Silk Road. Korean tombs exhibit many styles borrowed by and from the Chinese, such as the styles of how the tombs were built and the use of the four guardian beasts, such as Ssu Ling. Additionally, many indigenous Korean artifacts and culture were transmitted, along with Chinese culture, to the tomb builders of early Japan, such as horse trappings, bronze mirrors, paintings, and iron-ware. King Björn's barrow in Håga. A burial mound, Tumulus, part of the necropolis of Banditaccia at Cerveteri in Lazio, Italy. ↑ kurgan Webster's Third New International Dictionary, Unabridged. Merriam-Webster, 2002. Retrieved October 14, 2006. Albright, William F. "Interesting finds in tumuli near Jerusalem". Bulletin of the American Schools of Oriental Research (The American Schools of Oriental Research) 10 (April 1923): 1–3. Barkay, Gabriel. "Mounds of mystery: where the kings of Judah were lamented". Biblical Archaeology Review 29(3) (2003): 32-9, 66, 68. Retrieved May 22, 2008. Ismagulov, O. "Population of Kazakhstan from Bronze Epoch to Present (Paleoanthropological research)," Science (1970). Telegin, D. Ya. et al. Srednestogovskaya i Novodanilovskaya Kul'tury Eneolita Azovo-Chernomorskogo Regiona. Kiev: Shlyakh, 2001. Thomas, Cyrus. "Report on the mound explorations of the Bureau of Ethnology," in J. W. Powell Twelfth annual report of the Bureau of Ethnology to the Secretary of the Smithsonian Institution, 1890-91 (1894):3-730. All links retrieved May 27, 2014. Lenawee County Antiquities History of Lenawee County, Michigan. This page was last modified on 27 May 2014, at 16:51.